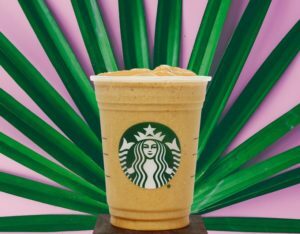 Starbucks is launching two smoothies starting Tuesday, August 14, 2018. These are plant-based so they’re vegan. The new smoothies come only in a grande size and are $5.95. Your two flavors are Almond Protein Blended Cold Brew Smoothie and the Cacao Protein Blended Cold Brew Smoothie. 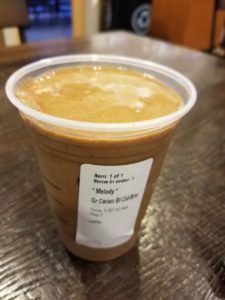 The Almond Protein Blended Cold Brew Smoothie is a medley of cold brew coffee, almond milk, banana-date sweetener, almond butter syrup, protein packet and ice. The almond butter syrup is like a syrup or sauce that you pump into a drink. The banana date sweetener is like a very thick sauce, like a mocha sauce. I’ve tried this one and it’s a little bland. I was super excited to hear about vegan smoothies at Starbucks. I’ve heard it said that about 6% of the US is vegan, and I’ve been vegan since May of this year. (Seems as though there are many more Keto warriors than vegans, though that’s just my perception.). However, the Almond Protein Cold Brew Smoothie just wasn’t all that flavorful to me. One thing for sure, the banana-date sauce is delicious. I tried the banana-date sauce in a short latte, and it was delicious. Move over mocha, a banana-date latte is amazing! 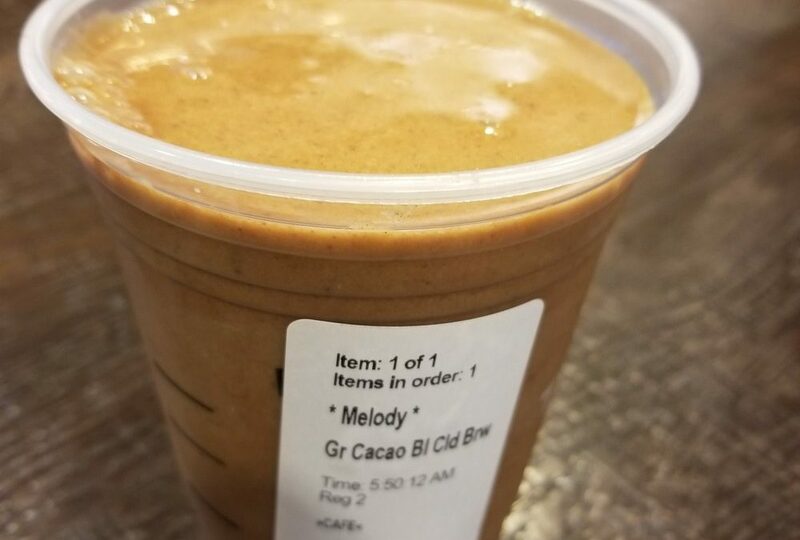 The second smoothie is the Cacao Protein Blended Cold Brew Smoothie. This smoothie is a mix of coconut milk, cold brew coffee, banana-date sweetener, cacao powder, a protein pack and ice. You may be wondering who makes the cacao powder used in this smoothie? I can’t say for certain, but I would make an educated guess that it is Nestle. It was about 3 months ago that Starbucks announced a partnership with Nestle. Personally, I like this one better than the Almond Protein smoothie. In the cacao smoothie, the banana-date syrup pops out – you can taste the banana flavor. The chocolatey-cacao flavor is very subtle. I’m pretty intrigued by the banana-date sauce. I wonder if you could make a fun Frappuccino with that sauce! Since both smoothies have a lot of ingredients, there’s very little cold brew flavor that comes through. You could amp your smoothie up by substituting in Frappuccino roast, or an add shot? I think there are a lot of ways to customize these drinks. It’s great that Starbucks is now offering these vegan-friendly drinks. Neither one would be my go-to beverage: I still prefer the simplicity of iced coffee no classic, black coffee, or cold brew – lots of coffee flavor without the calories. Each of these smoothies weigh in at about 275 calories. I would love to know what you think of these! Cocoa & Honey Cold Brew and a Totes Adorable Tote. Pom and Stormy: When Starbucks cold brew meets pomegranate! I LOVE the almond one! It’s not “sweet” which I appreciated. Everyone suggests adding a banana which I would imagine is delicious but I don’t want that much sugar/carbs. Hi! Any idea what the plant-based protein is? The app says under Allergens “not available” so at this time I can’t get out to try them until I know if it is soy based. Thanks for sharing, I haven’t tried either of these new drinks yet. Very sad the did away with the whey protein power, so I’ll be visiting Starbucks less and less. Can you get a chocolate smoothie with the plant protein powder? Wish that they would tell us just how much sugar is in these things. I’m not totally keto, but I have lost some weight this summer by cutting back on carbs. I’m still a Starbucks fan, but I now pay attention to the sugar and carb content of their food and drinks. And what about those who are diabetic? Like my husband. He might join me on my Starbucks runs if he knew which drinks he can have and which ones to avoid. Consider taking a look at the Starbucks app, when you look up a drink it lists a fair bit of information (though is useless for allergens, just a blanket statement). For diabetics, though, it quickly becomes a game of memorizing the few drinks they like that are healthy enough for them. I vote for revealing the sugar content in each beverage. I tried the cacao protein smoothie today and was so excited it was a plant based protein drink. However, thanks to Karen Ryans link showing the carbs and sugar, it will be my last purchase. As a pre-diabetic I must watch my carbs and sugar. Starbucks should disclose the hidden sugars and the carb content and not just the calories. So sad. Thanks Karen Ryan for the informative link. There is something wrong with the calculator on the website, the sugar content noted for these drinks is substantially different in the Sbux app versus on their website, there are not 80 grams of sugar in these drinks.